The papal conclave of 1492 (August 6 – August 11, 1492) convened after the death of Pope Innocent VIII (July 25, 1492), elected Rodrigo Borja as Pope Alexander VI. The first conclave to be held in the Sistine Chapel, the election is notorious for allegations of simony. Of the twenty-three cardinals participating in the conclave, fourteen had been elevated by Pope Sixtus IV. The Cardinals of Sixtus IV, known as the "Sistine Cardinals" and led by Giuliano della Rovere, had controlled the conclave of 1484, electing one of their own, Giambattista Cibo as Pope Innocent VIII. Since 1431 the composition of the College of Cardinals had been radically transformed, increasing the number of cardinal-nephews (from 3 to 10), crown-cardinals (from 2 to 8), and representatives of powerful Roman noble families (from 2 to 4). With the exception of three curial officials and one pastor, the cardinals were "secularly-minded princes largely unconcerned with the spiritual life of either the Latin church or its members." At the time of Innocent VIII's death, the names of Cardinals Gherardo and Sanseverino had not been published, thus making them ineligible to participate in the conclave; however, both were published as an act of the College in sede vacante, Gherardo having been pushed by Orsini and Sanseverino by Sforza. Notre Dame de Paris, known simply as Notre Dame in English , is a Gothic cathedral on the eastern half of the Île de la Cité in Paris, France, with its main entrance to the west. It is still used as a Roman Catholic cathedral and is the seat of the Archbishop of Paris. Pope John Paul II (Latin: Ioannes Paulus PP. 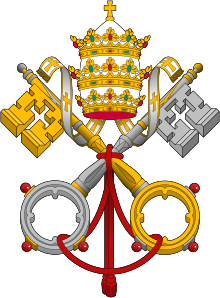 II, Italian: Giovanni Paolo II, Polish: Jan Paweł II) born Karol Józef Wojtyła (help·info) [ˈkaɾɔl ˈjuzεf vɔi̯ˈtɨwa]; 18 May 1920 – 2 April 2005) reigned as the 264th Pope of the Roman Catholic Church and Sovereign of the State of the Vatican City from 16 October 1978, until his death, almost 27 years later, making his the second-longest pontificate in modern times after Pius IX's 31-year reign. He is the only Polish pope, and was the first non-Italian pope since the Dutch Adrian VI in the 1520s. He is one of only four people to have been named to the Time 100 for both the 20th century and for a year in the 21st. Canonized in 2014, he was made the patron of World Youth Day even before canonization, for 2008 in Sydney, Australia. He started those days for youth in 1986. ... that when Pope Alexander VI (pictured) issued his bull Dudum siquidem, the mention in it of India caused consternation in Portugal? ... that the parishioners of Highweek petitioned the pope for their own graveyard? ... it is believed that Minuscule 826 is the archetype of the textual family 13? Mark the Evangelist (מרקוס, Greek: Μάρκος) (1st century) is traditionally believed to be the author of the Gospel of Mark and a companion of Peter. He also accompanied Paul and Barnabas in Paul's first journey. After a sharp dispute, Barnabas separated from Paul, taking Mark to Cyprus (Acts 15:36-40). Ironically, this separation helped bring along the creation of the Gospel of Mark. Later Paul calls upon the services of Mark, the kinsman of Barnabas, and Mark is named as Paul's fellow worker.He is also believed to be the first Pope of Alexandria by both the Coptic Orthodox Church and the Greek Church of Alexandria, and thus the founder of Christianity in Africa. His evangelistic symbol is the lion.In 828, relics believed to be the body of St. Mark was stolen from Alexandria by two Venetian merchants and were taken to Venice, where the Byzantine St. Theodore had previously been the patron saint. A basilica was built there to house the relics.There is a mosaic on this Venetian basilica showing how the sailors covered the body relics with a layer of pork.Since Muslims are not allowed to touch pork, this action was done to prevent Muslim intervention in the relics removal. Attributes:Lion in the desert; bishop on a throne decorated with lions; man helping Venetian sailors; man holding a book with "pax tibi Marce" written on it; man holding a palm and book; man with a book or scroll accompanied by a winged lion; man with a halter around his neck; man writing or holding his gospel; rescuing Christian slaves from Saracens; lion.